In 1916, teenage Irish immigrant Liam Garrity struggles to survive on his own in Brooklyn, while his family back in Ireland faces reprisals during the violence of the Easter Rising. 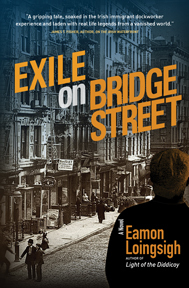 With taut writing by a master of historical fiction, EXILE relates Liam’s compelling personal story against a background of NYC’s brawling streets, Brooklyn Irish waterfront gangs, an influenza epidemic, the rest of Italian organized crime, and the start of American involvement in World War I. The followup to LIGHT OF THE DIDDICOY, Loingsigh continues a story that has been hidden until now. Light of the Diddicoy is the brutal saga of Irish-American gangs on the Brooklyn waterfront in the early part of the twentieth century, told through the eyes of Irish immigrant Liam Garrity. Forced at age 14 to travel alone to America on the eve of the 1916 Easter Rising, Garrity stumbles directly into the hard-knock streets of the Brooklyn pier neighborhoods run by Bridge District gang The White Hand. In the industrialized enclaves where Famine Irish settled a generation earlier, Garrity has no choice but to use any means necessary to survive within the clan-like loyalties of the gang, and carve out his place in a no-holds-barred world of a community living outside the law. Why I Wrote Light of the Diddicoy; feature article by author Eamon Loingsigh on LitKicks, the world’s oldest literary blog. Feature article on Light of the Diddicoy author Eamon Loingsigh in The Irish Echo. “Spotlight on Author and Historian Eamon Loingsigh” Artist without Walls blog, March 22, 2014. Q&A with author Loingsigh detailing inspiration for writing and personal life. 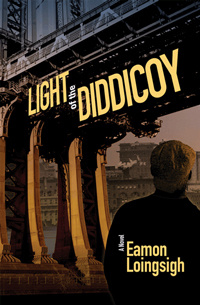 “Why I Wrote Light of the Diddicoy” featured guest blog by Eamon Loingsigh on LitKicks.com, February 16, 2014. Author Loingsigh details his process and inspiration for writing his historical novel about Brooklyn’s early 20th century Irish gangs. “News and Info for Light of the Diddicoy,” guest blog by Eamon Loingsigh on The New Wild Geese blog with details and photos of events related to Light of the Diddicoy. Journalist EAMON LOINGSIGH has long held a great fascination for the history of Irish-Americans in New York City. His family emigrated from Ireland in the late nineteenth century, and his grandfather and great-grandfather ran a longshoreman’s saloon on Hudson Street in Manhattan from 1906 to the late 1970s. Loingsigh studied journalism at University of South Florida. He is the author of numerous articles on Irish-American history, as well as the novella An Affair of Concoctions and the poetry collection, Love and Maladies. He currently lives in Brooklyn, New York.